In 1996, when my family got a modem and signed up for AOL, my hours of nightly screen time shifted from television to the computer. After leaving for college, I never had a television set in my home—at least not one that’s good for anything more than playing DVDs—and for me television has become a prop associated with certain locations: the ambient CNN in airports, or the numbing luxury at my parents’ house that allows me to surf an easily navigable set of discrete elements, rather than choosing what to view by picking keywords and clicking metonyms. Antoine Catala feels roughly the same way about television, as I learned on a visit to his studio this summer, and “TV Show” his upcoming solo exhibition at 179 Canal, a new artist-run space in downtown New York, is about television’s slow demise—a phenomenon felt acutely this year as broadcast signals were converted to digital, befuddling one of television’s biggest audiences, the elderly. Catala’s comic-strip paintings of screen stills, which he dashed off quickly with glances at the television, underscore television’s identity as an industrial product, far slicker than anything one person can make alone and produced using templates. His translucent paintings on working television sets also highlight the conventions for arranging shots, as faces and settings of the broadcast form repetitious patterns around his overlaid additions. 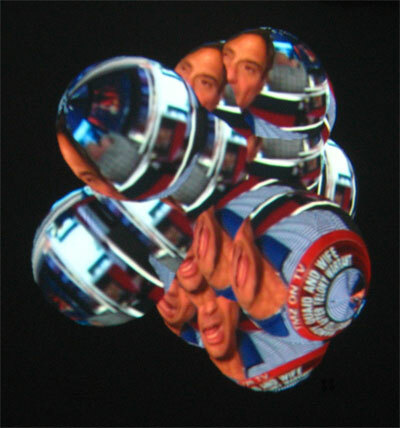 TV Blobs manipulate live feeds to make distorted, fluid three-dimensional graphics. Catala treats both the television set’s physical mass and the broadcast stream as readymade sculptural material, positioning both form and content as artifacts of the industrial age in a world that’s moving on to something else. “TV Show” opens tonight at 7:00pm.